Xherdan Shaqiri scored one of the goals of the season as Stoke earned a thrilling win at Everton through Marko Arnautovic's injury-time penalty. The Potters led through Shaqiri early on and after Romelu Lukaku levelled from eight yards, the Swiss looped a stunning half-volley over Tim Howard. Lukaku struck again after the break and Gerard Deulofeu tapped Everton ahead. But Joselu volleyed his first Premier League goal and Arnautovic won it after being brought down by John Stones. Arnautovic - impressive himself throughout - will be deemed the match winner, but Shaqiri's strike will capture copious column inches in the aftermath of a win which moves Stoke two places above Everton and into ninth. An ex-Inter Milan and Bayern Munich forward, summer-signing Shaqiri perhaps symbolises the ambition Mark Hughes' side now have and his first goals for the club will raise hopes of many more to come. Stoke kept eight clean sheets in the 11 league games leading up to this win and although their frugal side went missing at Goodison Park, flair at the other end was on show throughout. Shaqiri's first from six yards saw the combination of Bojan and Arnautovic craft a sublime team goal, while his second - from a wonderful Bojan pass - saw him reach for the ball and clip it over Tim Howard and into the top corner from 18 yards. "That is the best goal I have seen this season," said Final Score pundit Garth Crooks. "He knew exactly what he was doing, it is absolutely sublime." Everton had lost just once in eight league games before kick-off but with no back-to-back wins in the league this season, their fans could be forgiven for wishing their side packed the killer punch Stoke mustered on Merseyside. Hughes made no changes to his squad despite a 48-hour turnaround from Saturday's win over Manchester United but the likes of Ibrahim Afellay and Glenn Whelan delivered displays of note, both completing 95% of their passes. It briefly appeared that substituting Bojan moments before Lukaku pulled a long ball down to fire Everton level at 2-2 would prove key, but after falling behind, Stoke's fresh legs earned their manager a fifth league win in eight games. Arnautovic delivered a telling cross for substitute Joselu to smash a smart volley home and picked himself up to slam a penalty down the middle despite slipping before making contact. It was a fitting reward as no Stoke player completed more sprints than the Austrian's 54 in the game and although Shaqiri's brilliance will overshadow such work ethic, the Potters admirably married graft with quality. Everton's industry and spirit are tough to question after they fought back to lead late on but they will rue the chance to close out the victory having led with just 10 minutes to spare. There may be some contention around the winning penalty - referee Mark Clattenburg took an age to point to the spot - but even allowing Stoke back into the game having fought so hard to earn a lead was sloppy. In all, Everton had 15 shots and as many crosses but the end result smacks of the inconsistency which continues to hamper their hopes of a push for a top-four spot. At the halfway stage of the campaign, they are five points worse off than they were at the same point last season and the gap to Manchester City in fourth is now nine points. Will Roberto Martinez regret making four changes to the side which won at Newcastle on Boxing Day? His introduction of James McCarthy into the side after a month out injured backfired as the midfielder limped off early on. In Lukaku, they now boast the Premier League's joint top scorer with Jamie Vardy on 15, but three wins from 10 home matches this season is a damning statistic they must improve quickly if their final league position is to match their ambitions. Everton manager Roberto Martinez on Stoke's penalty: "Looking at the replay it shows John Stones touches the ball. That decision is hard to take. To get a decision wrong like that so late in the game makes you feel furious and is unacceptable." Stoke manager Mark Hughes: "The only thing lacking up until today for Shaqiri was goals - performances had been fine - but now he has added that. He has that quality - it's his first mark in terms of goals and I'm sure there will be more to come. It was end to end and I thought both sides came out with great credit." Everton scored with all three of their shots on target. The Toffees have not won at home since 21 November, a 4-0 win over Aston Villa. Stoke have conceded 19 goals this season, only four sides have leaked less. Stoke are four points better off than at the halfway stage last season. Stoke can make it three wins from three if they win at West Bromwich Albion on Saturday while Everton host Tottenham 24 hours later. Match ends, Everton 3, Stoke City 4. Second Half ends, Everton 3, Stoke City 4. Goal! Everton 3, Stoke City 4. Marko Arnautovic (Stoke City) converts the penalty with a right footed shot to the high centre of the goal. John Stones (Everton) is shown the yellow card for a bad foul. Penalty conceded by John Stones (Everton) after a foul in the penalty area. Penalty Stoke City. Marko Arnautovic draws a foul in the penalty area. Attempt missed. Seamus Coleman (Everton) left footed shot from the right side of the box is too high. John Stones (Everton) wins a free kick in the attacking half. Offside, Stoke City. Ibrahim Afellay tries a through ball, but Ryan Shawcross is caught offside. Foul by John Stones (Everton). Marco Van Ginkel (Stoke City) wins a free kick on the right wing. Substitution, Stoke City. Marco Van Ginkel replaces Xherdan Shaqiri. Offside, Stoke City. Ibrahim Afellay tries a through ball, but Jonathan Walters is caught offside. Offside, Everton. Ross Barkley tries a through ball, but Seamus Coleman is caught offside. Hand ball by Joselu (Stoke City). Corner, Everton. Conceded by Philipp Wollscheid. Goal! Everton 3, Stoke City 3. Joselu (Stoke City) right footed shot from the right side of the box to the high centre of the goal. Substitution, Stoke City. Jonathan Walters replaces Geoff Cameron. Attempt missed. Gerard Deulofeu (Everton) right footed shot from the centre of the box misses to the left. Goal! Everton 3, Stoke City 2. 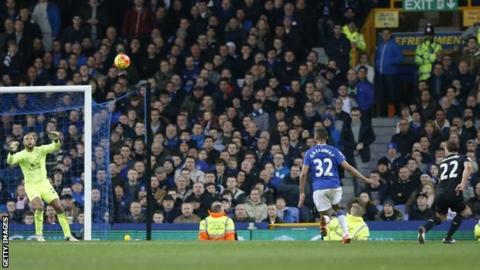 Gerard Deulofeu (Everton) right footed shot from very close range to the centre of the goal. Assisted by Ross Barkley. Corner, Everton. Conceded by Ryan Shawcross. Attempt blocked. Steven Naismith (Everton) right footed shot from the centre of the box is blocked. Assisted by Romelu Lukaku. Offside, Stoke City. Marko Arnautovic tries a through ball, but Joselu is caught offside. Substitution, Everton. Steven Naismith replaces Tom Cleverley. Goal! Everton 2, Stoke City 2. Romelu Lukaku (Everton) right footed shot from the centre of the box to the bottom left corner. Assisted by Tom Cleverley. Substitution, Stoke City. Joselu replaces Bojan. Attempt missed. Arouna Koné (Everton) right footed shot from outside the box is too high. Assisted by Tom Cleverley. Attempt blocked. Ross Barkley (Everton) right footed shot from the right side of the box is blocked. Assisted by Gerard Deulofeu. Attempt saved. Geoff Cameron (Stoke City) right footed shot from outside the box is saved in the centre of the goal. Assisted by Erik Pieters. Gerard Deulofeu (Everton) wins a free kick in the attacking half.